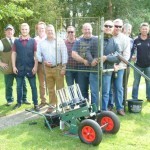 ShootingCoachUK – Page 2 – Shooting to success! October 16, 2014 | By John Farley | No Comments | Filed in: Charity, Coaching. On 5th September , there was a shoot by a small group at Sayes Park Shooting School, coached by myself and Luke . October 3, 2014 | By John Farley | No Comments | Filed in: Coaching. A party of chinese who were touring the UK came to Sayes Park Shooting School to try out shooting, and even managed to help with some crop protection! Yvonne Oakley & Jean Botterman Memorial Charity Clay Shoot. May 29, 2014 | By Dave Court | No Comments | Filed in: Coaching. April 7, 2014 | By Dave Court | No Comments | Filed in: Uncategorized. February 12, 2014 | By Dave Court | No Comments | Filed in: Coaching, Game Shooting. January 16, 2014 | By Dave Court | No Comments | Filed in: Coaching, Game Shooting. January 15, 2014 | By Dave Court | No Comments | Filed in: Coaching, Game Shooting. January 15, 2014 | By Dave Court | No Comments | Filed in: Uncategorized.